London continues to provide the house scene with an influx of fresh talent, And Get Twisted's latest edition is sure to be one of these future stars. "Deceptive" knows only too well about the culture that gripped the nation in the early 90s. Becoming a regular clubber, He took to the studio in the mid to late 00s to express his passion for house music. It wasnt long until he started to see success mounting up with a few releases under his belt with a previous alias. He now plays on the heartstrings of any old school raver with his straight up intentions of creating dance floor friendly vibes, the prefect fit for Get Twisted Records. In lead track Down With Me Deceptive shows glimpses of his past influences. Hard hitting garage drums, swing percussion & a sweet vocal set the tone of the record from the outset. A chugging bass line drives the record, while the lead line shows Deceptives emergence from the rave scene. Down With Me is strong from start to finish, perfect for injecting energy into any dance floor. Dont Make is a more housey affair. From the get go its balanced padwork and strings build emphatically to a beast of a bassline. But where this track really comes into its own is during the breakdown. While pads and strings give a sense of euphoria, the thunderous kick and lead change up take this track to a deeper level. 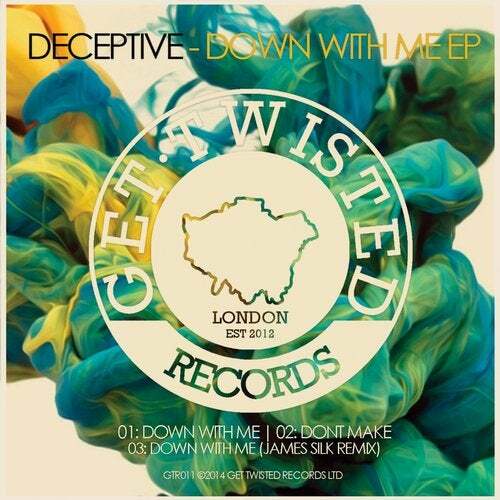 A debut E.P from Deceptive sets the standard for what is set to be a promising future!